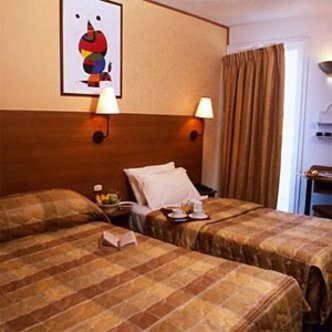 The Best Western Parc des Expos is located at the southern door of Paris, only two kilometers from the major exhibition place Paris Expo - Porte de Versailles (Mondial de l'Automobile, Salon de l'Agriculture etc.) The 53 air-conditioned rooms are all equipped with LCD television screens (European Channels and Canal Plus), tea and coffee makers, double-glazed windows, and Wi-Fi access (rooms and public areas) The hotel offers a private patio on the back of the building and also the private underground parking offers 35 places. A bar and room service together with our friendly a helpful staff offer our guests a comfortable and pleasant stay.